The April 27, 2011 tornado that hit Great Smoky Mountains National Park in eastern Tennessee was a powerful EF4 storm (its direction is indicated by the black arrow). 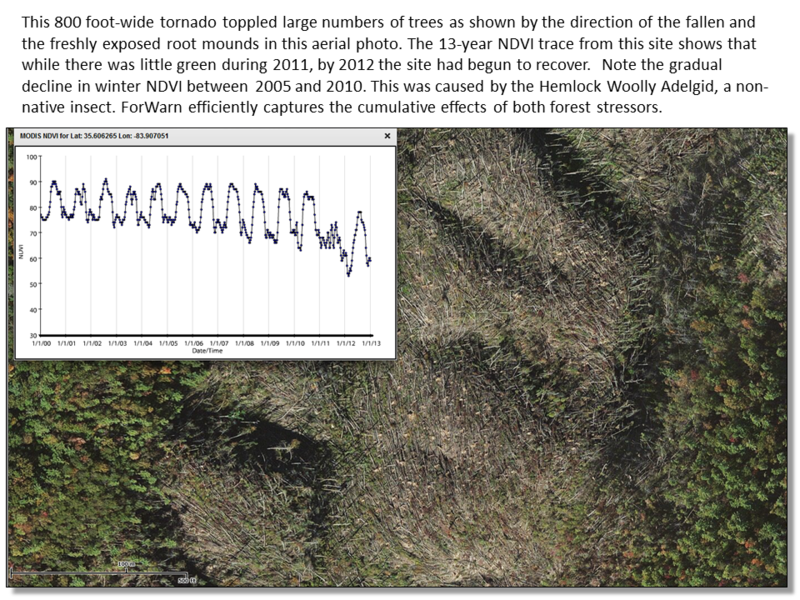 Wind storms are important natural disturbances for Southern Appalachian forests, and the ecological impacts of this event will be long-lasting as shown in the inset photograph taken by National Park staff soon after the event. Also note the forest disturbance northwest of Maryville. That was the result of strong wind and hail during the same regional event. (ground image: National Park Service; front page image: Richard Spriggs, USFS Forest Health).